Here’s a quick experiment in data visualisation to provide an instant insight into a story on how the blame game is being played by columnists. 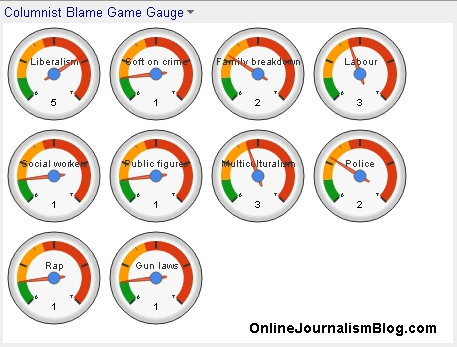 The data is taken from a Liberal Conspiracy blog post – I’ve transferred that into a spreadsheet with limited categories and used the Gauges gadget to visualise the totals. A screengrab is below – but there is also an embed code that provides a gauge that will be updated whenever a new columnist is added. See the spreadsheet for both the gauge and the raw data. This entry was posted in data journalism and tagged columnists, gauge, liberal conspiracy, uk riots, visualisation on August 12, 2011 by Paul Bradshaw.